1930 Massachusetts Registration Sticker - $20.00 : Bob Hoyts Classic Inspection Stickers, Add a Final Touch to your Restoration! This 1930 Massachusetts Sticker is not an inspection sticker but it was required. 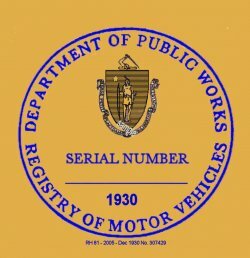 It was probably an early version of todays registration paper to verify the 1930 Massachusetts plate. This has our patented "peel and stick" format which allows attaching this sticker to the inside windshield lower passenger side next to the Inspection sticker.